This entry was posted on February 2, 2014 at 8:00 pm and is filed under Drama, Romance with tags 2014. You can follow any responses to this entry through the RSS 2.0 feed. You can leave a response, or trackback from your own site. This sounds like a really underwhelming, dumbed-down version of Tie Me Up! Tie Me Down!. It also sounds like a movie that just isn’t what Jason Reitman would usually do. I’m so glad I ended up not wasting ten bucks on this. Thank you for keeping me from going out to the theater this weekend as well. I never saw Tie Me Up! Tie Me Down! Did they bake pies in that film too? That’s a very important part of this story. LOL. No, it’s basically about a guy who’s just got out of prison eventually falls in love with this woman who he’s been tying to the bed so that she can’t escape. But no, no pies. Not sure Pedro Almodóvar would approve of this movie! Nice one! As you know I did give it an extra star but do recognize its faults. I really didn’t have a problem with a lot of what you mentioned. I took from it that she was doing what he said because he still made thinly veiled threats towards her son. He didn’t tie him up because they could always say “he is just a kid”. All the handyman stuff filled a void in his life too. The peach pie scene….I have nothing! It’s one of the dopiest scenes I’ve seen in a long time. I had bigger issues with how fast this whole romance developed, some o the sappy dialogue latter on, and the underdeveloped puberty struggles that pop up later on. But in the end I did like these characters enough. I saw this trailer and wanted to see this – and then a little later they started showing the ads on TV playing Rhianna over the scenes, and it turned me off. Just not a good fit at all. So, I was on-the-fence about it and now this may help me hop over to one side. I may regret this, but my hopes have shot up for “Dead or alive, you’re coming with me” coming out next week. I’m looking forward to it. Did you like the original? Kurtwood Smith was truly one of the meanest cinema villains I’ve ever seen. One of the most memorable, as well. I still to this day remember him. Nothing says romance like “Stay” by Rihanna, right? The lyrics to “Where Have You Been” would’ve worked too. Of course I’ve seen the original RoboCop. I have absolutely no desire to see the remake. Sorry. Oh okay. Did you like the original? Just jumping in on your Robocop comment because I watched it on Sunday when there was a marathon on, I forgot Kurtwood Smith was the villain. But he was awesome – my favourite line has to be “Can you fly, Bobby? !” His delivery is priceless. Yes he’s talented. Can’t forget Red Forman on That ’70s Show. I love that show. I’ll have to watch the series. Fez might have been my favourite, but not just because his name sounded like candy. One of the meanest villains ever. The scene where they killed Murphy was absolutely brutal. I hated that whole gang, particularly Boddicker. Great performance by Kurtwood. It really was. I think I’ll miss the gore during the remake. Mean villains for sure, but fantastic! Great, hilarious review. This movie has been taking a beating so far, critically. This film is underrated. Not great not bad. Hmmmm underrated is not a word I would use myself but glad you enjoyed it. Yep, I can tell you had some fun chopping this one down, as did I, as you know already. This movie was utter ridiculousness. I wanted to enjoy myself because Josh Brolin and Kate Winslet together make for an interesting enough pair but in any other circumstances they would have been dynamite. Not to mention, there were more than a few moments in this film (like when Henry explains that he “even took her out on a date”) that made me cringe. 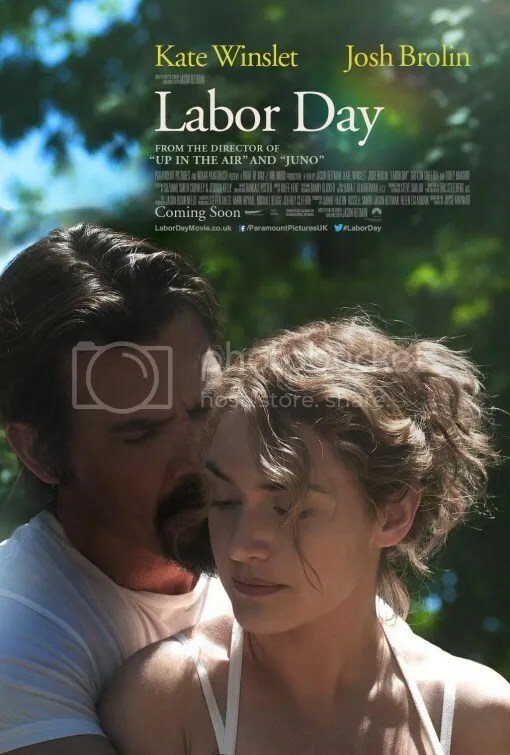 Labor Day is really a sad movie haha. But your review is great. Thanks! I thought the actors did what they could. Unfortunately the script was so bad, not even the mighty Kate Winslet could save it. This made me chuckle! I might go and see this for the unintentional comedy value, at least I’ll know how to bake pies! Oh yeah, it would make a great cooking segment on a morning talk show like Live! with Kelly and Michael. Nice review. I’ve never been very big on Reitman’s work (his movies are enjoyable but forgettable for myself at least) and this looked like a Nicolas Sparks adaptation. I’ll be skipping this. Jason Reitman is still one of our finest directors working today. This isn’t typical of his work and I’ll overlook this hiccup in his career. I guess just the fact that Kate Winslet was in it intrigued me. She even got a Golden Globe nomination which I should’ve remembered doesn’t really count for much. great to know – thanks for the warning! You’re welcome. It hasn’t gotten the best reviews. great and entertaining review mark. just saw this today and agree with your review. i was flabbergasted in general by the story. I can maybe accept the idea of a depressed woman making wrong romantic decisions. but by immediately having the convict give several detailed cooking lessons and then later receiving dancing lessons from her(think it was the cha-cha) just seems out of place for the predicament. Then Frank started making really bad decisions. He should’ve left a long time ago. The fact that he hung around for the whole weekend was stupid. Based on how much work he got done around the house, it actually felt like he had been there for weeks. Then he interacts with the neighbor kid. Utter nonsense. That pie making sequence was a riot. Cheers! Every once in awhile, a film like this really connects with an audience. The Notebook is one example.